I previously illustrated - taking a sideways glance in one of the self-employment pieces here - some of the dynamic shifts underlying overall changes in UK employment levels. Sunder Katwala from British Future has pointed out that people’s feelings about immigration don’t seem to match very well actual levels of immigration to their region (link to right or below) and concludes “The regional pattern also suggests that immigration anxiety often reflects general economic insecurity more closely than the local scale of immigration”. 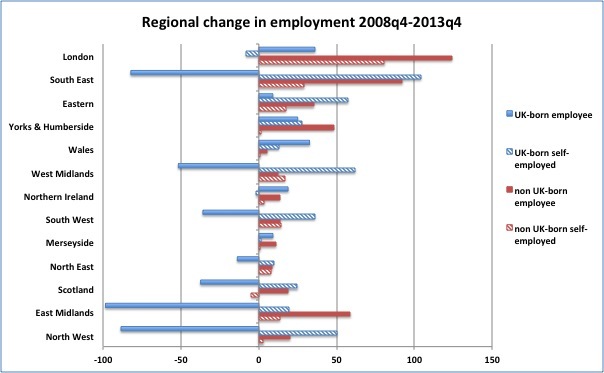 Change in employment by country of birth over recent years differs significantly across regions. In the European election UKIP and Labour shares of the vote went up in all regions in England and Wales and Conservative and Liberal Democrat shares went down. That’s not necessarily very revealing on its own, so having these numbers for employment change by region handy, I thought I’d see whether the voting in the election seemed in any way related to these as it might indicate feelings of a more specific economic insecurity. I’ve taken figures for results from the BBC website here to calculate percentage changes in share of the vote by party and region in England and Wales between the 2009 and 2014 elections. The BBC lists simple change – e.g. an increase from 10% of the vote to 15% of the vote is reported as 5%. The percentage change in the share of the vote this represents is 50%. I’ve then used the employment numbers by region from the Labour Force Survey, identifying UK-born and non UK-born and compared the difference in levels between the final quarter of 2008 and the final quarter of 2013. Both represent employment levels the same number of months before the 2009 and 2014 elections. As it’s the potential impact of impression and feelings we’re considering here, figures from a little before election time will probably best indicate that …. On the other hand there is much clearer correlation between change in numbers of people working in the region who were born outside the UK and change in shares of the vote for all parties. 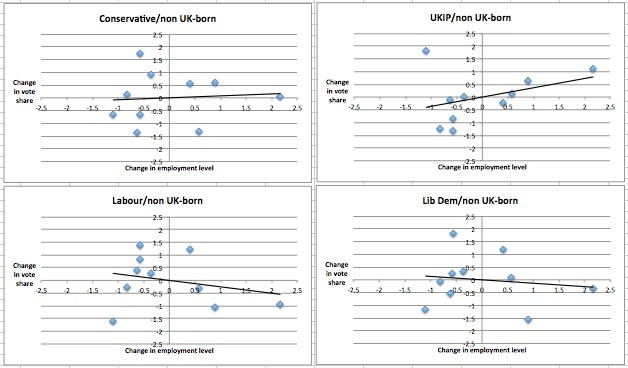 Increasing non UK-born employment in a region is associated with higher levels of voting for both the Conservatives and UKIP. 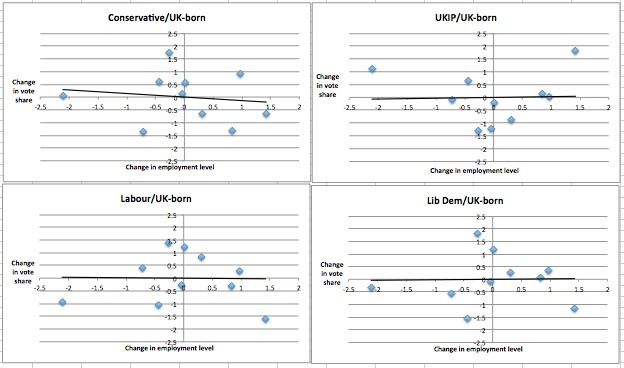 Increasing non UK-born employment in a region is associated with lower levels of voting for both Labour and for Liberal Democrats. Now of course Conservative and Liberal Democrat shares of the vote actually went down in all of these areas, so what this suggests is that Conservative share dropped less and Liberal Democrat share dropped more in regions with greater increases in non-UK born employment. Similarly, although UKIP and Labour shares went up in all regions, UKIP’s share increased more and Labour’s share increased less in regions with greater increases in non-UK born employment. 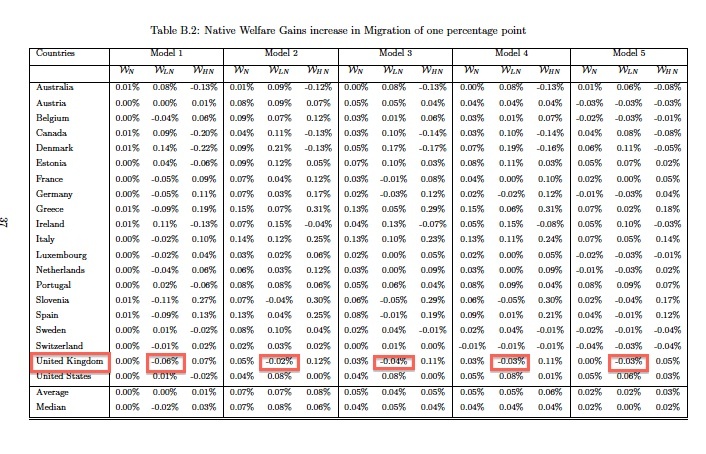 In this context it was also interesting to see new Europe-wide research finding that uniquely among higher-income countries, the UK experienced negative impacts on lower-skilled ‘natives’ over the whole range of models used by the researchers. As Sunder says in his article, “Policy-makers, whose Treasury models show immigration contributing to growth and economic recovery, need to persuade a public which is sceptical about this. Broader agendas for growth, jobs and opportunity would do more than seeking to fact-check public perceptions about correlations or causations between immigration and the availability of jobs. That will often be received as dismissing public concerns as wrong-headed, and that usually only persuades those already onside”.